As you may know, Xfce4 terminal supports the Quake style drop-down mode since version 0.6. Just a parameter --drop-down will start xfce4-terminal just like quake, yakuake, or tilda. 1. Open xfce4-setting-manager from Application menu or Alt+F2 Application Finder box. 2. Click on the Keyboard icon under Hardware section. 4. Click on OK and set a keyboard shortcut in next window. 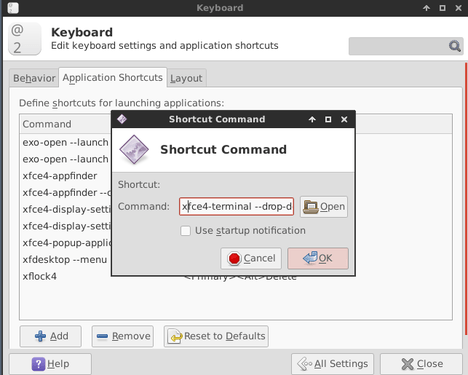 Now you’re able to press the keyboard shortcut to launch a drop-down Xfce4 terminal. Click the button at right-bottom to open the preferences dialog and edit the width, height, opacity, duration and more! I have xfce4-terminal installed in Ubuntu 14.04 (unity interface) and bound F12 to the `xfce4-terminal –drop-down` command. When I press F12, the terminal opens, but when I press F12 again, it does not go away. This is not the case in my Arch linux installation with xfce window manager, pressing F12 again makes the terminal go away. From your post, it is not clear if you are using Ubuntu or Xubuntu but maybe the latter. Do you have any recommendations on where to start trouble-shooting? Also, on both Arch and Ubuntu, I select the option to `Keep window open when it loses focus` but that does not seem to work. Selecting it does not change anything, the window still closes when I change focus to another window. Any ideas of fixing this?